Hachi: A Dog's Tale is a 2009 drama film. Based on the true story of a faithful Akita Inu, the titular Hachikō, it is directed by Lasse Hallström, written by Stephen P. Lindsey，Kaneto Shindo and stars Richard Gere, Joan Allen and Sarah Roemer. The subject is a remake of the 1987 Japanese language film, Hachikō Monogatari (ハチ公物語? ), literally "The Tale of Hachiko". 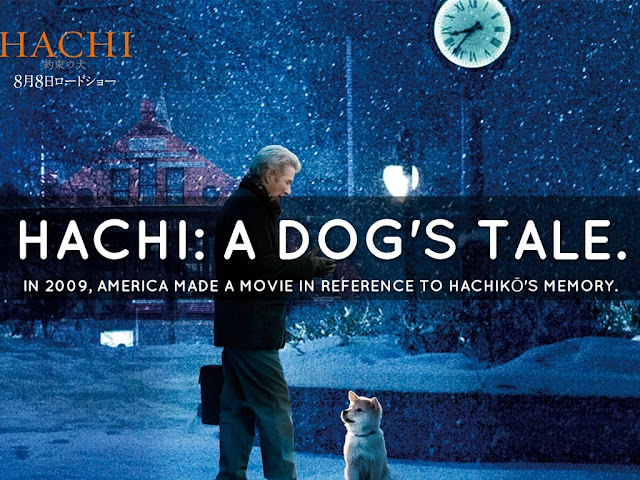 Hachi: A Dog's Tale premiered at the Seattle International Film Festival on June 13, 2009, and its first theatrical release was in Japan on August 8. Sony Pictures Entertainment decided to forgo a U.S. theatrical release. The film was given a UK theatrical release on March 12, 2010, courtesy of Entertainment Film Distributors, and opened in over 25 countries throughout 2009 and 2010. Total foreign box office was $46.7 million as of January 2011. Students are giving oral presentations about personal heroes. Ronnie's subject is his grandfather's dog,Hachikō. Years earlier, a puppy is sent from Japan to the United States, but escapes when his cage falls at an American train station. Professor Parker Wilson finds the dog and takes it home with the intention of returning the animal to its owner. His wife, Cate Parker, does not want them to keep the puppy. Later that night, Parker learns that the dog is an Akita. The following morning, he takes him to work, where Ken, a Japanese professor, transliterates the symbol on the collar as 'Hachi'—Japanese for the number 8—signifying good fortune. Parker decides to call the dog Hachikō. Parker attempts to play fetch with Hachi, but Hachi refuses. Cate receives a call from someone wishing to adopt the puppy, but having seen how close her husband is with Hachi, she declines. Parker continues to be mystified by Hachi's refusal to do dog-like activities like chase and fetch. One morning, Parker leaves for work and Hachi follows him to the train station; he refuses to leave until Parker walks him home. Later in the afternoon, Hachi walks to the station, to wait patiently for Parker to come home. Parker relents and walks Hachi to the station every morning. After Parker's train departs, Hachi walks home, returning in the afternoon to see his master's train arrive and go home together. They continue to do this every day. One day Parker gets ready to leave and Hachi barks at him and refuses to join him. When Parker does leave, Hachi chases him while holding his ball. Parker is surprised but pleased that Hachi is finally willing to play fetch with him. Not wishing to be late, Parker catches his train despite Hachi's barking. Later that day Parker is teaching, still holding Hachi's ball, when he suddenly suffers a heart attack and dies. At the train station, Hachi waits patiently as the train arrives, but there is no sign of Parker. He remains, lying in the snow, for several hours, until Parker's son-in-law Michael (Ronnie Sublett) comes to collect him. The next day, Hachi returns to the station and waits. As time passes, Cate sells the house and Hachi is sent to live with her daughter Andy (Sarah Roemer), Michael, and their baby Ronnie. However, at the first opportunity, Hachi escapes and finds his way back to the station, where he sits at his usual spot. Andy arrives and takes him home, but lets him out the next day to return to the station. For the next ten years, Hachi waits for his owner. His loyalty is profiled in the local newspaper. Cate comes back to visit Parker's grave where she meets Ken. Walking past the station, Sheegwa is stunned to see Hachi maintaining his vigil. Overcome with grief, Cate sits and waits for the next train with him. At home, Cate tells the now ten-year-old Ronnie about Hachi. Hachi continues his daily walk to the same spot in front of the train station to his final day when he recollects his life with his master. He then imagines Parker coming out of the station and the two greeting each other. Hachi is last seen lying on the snow, alone and still. Back in his classroom, Ronnie, forms his conclusion why Hachi will forever be his hero. Ronnie's story has clearly moved the class, with some students holding back tears, even those who had laughed at the beginning. After school, Ronnie is met coming off the school bus by his dad and his own puppy, also named Hachi. Ronnie and Hachi walk down the same tracks where Parker and Hachi had spent so much time together. The closing cards reveal information about the real Hachikō, who was born in Ōdate in 1923. After the death of his owner, Hidesaburo Ueno, in 1925, Hachikō returned to the Shibuya train station the next day and every day after that for the next nine years. The final card reveals that the real Hachikō died in March 1935. A photo of his statue in front of the Shibuya train station is the last image shown before the credits roll. The putted password it it..